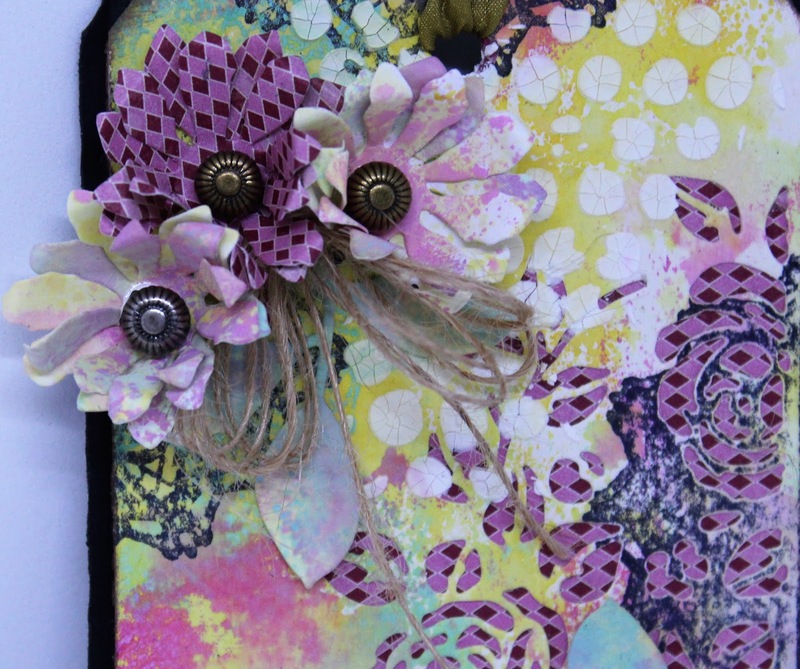 Welcome to March…Pam Bray here today on the Creative Scrapbooker Magazine Blog creating a fun little mixed media tag. Time to start creating and what better way but to grab some Tim Holtz fabulous products to create with! 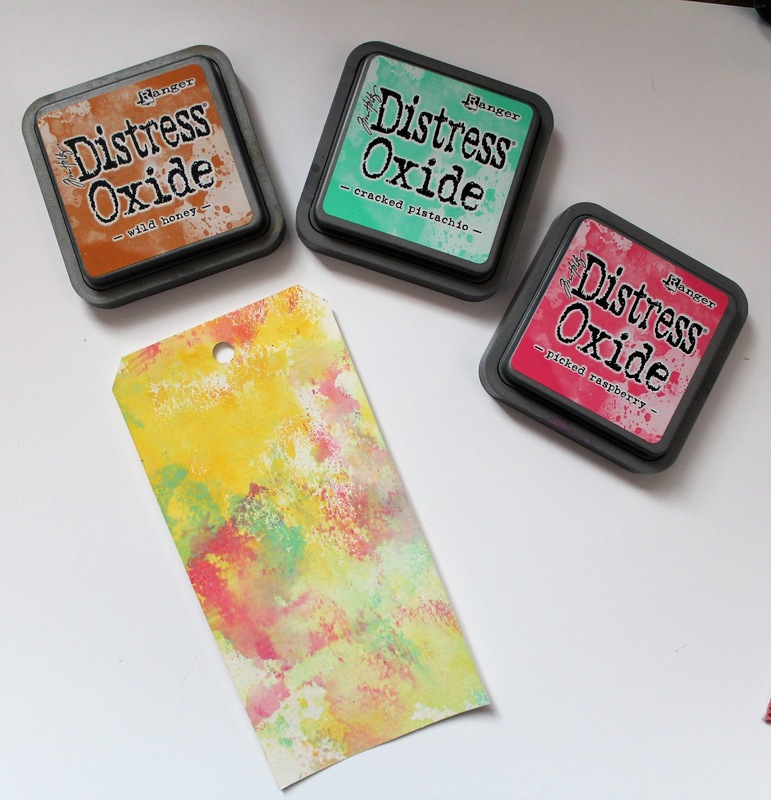 I am sharing a tutorial on how easy the Ranger Distress Oxides are to use along with Sizzix Dies and Stampers Anonymous Stamps to “create” a mixed media tag! Begin by die cutting a Sizzix Tag and Book Plate from white cardstock and chipboard. Apply Wild Honey to craft mat; spritz with water and drag white cardstock through the mist. Dry. Repeat with Picked Raspberry and again with Crackled Pistachio to create background paper. Remember to dry between applications. 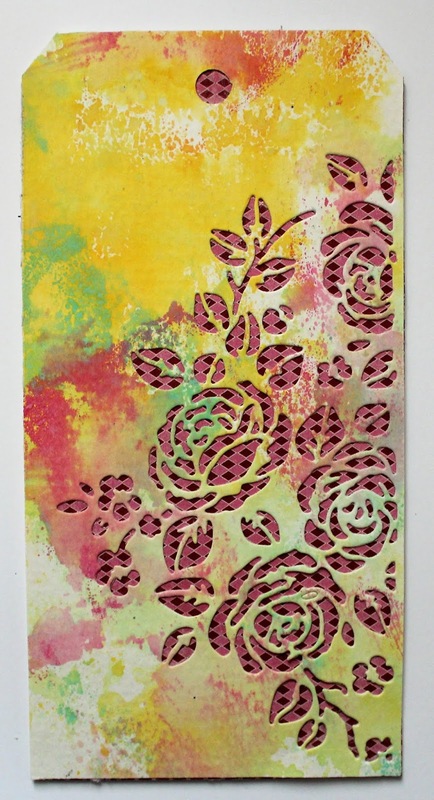 Die cut prepared cardstock using one of the dies from Sizzix Mixed Media #5 Die Set. Adhere pattern paper to the top of chipboard. Adhere prepared background to top of prepared chipboard. Stamp doily from Stampers Anonymous Stamp Set using Cracked Pistachio Distress Oxide and Ranger Jet Black ink. Lay stencil from Stampers Anonymous Stencil on top of the prepared tag. Apply textured paste to top with a palette knife. Dry. Cut black cardstock slightly larger than prepared tag; distress edges using distress tool. Adhere prepared background tag to the top of black cardstock. Cover label that was die cut from chipboard with pattern paper. Apply Remnant Rub-on to the label. Add the prepared label to the bottom of the tag. Apply Wild Honey to craft mat; spritz with water and drag white card stock through the mist. Dry. Repeat with Picked Raspberry and again with Crackled Pistachio to create background paper. Remember to dry between applications. Die cut flower from Sizzix Tattered Florals Die. Layer flowers together; adhere to top of the prepared tag. Add small metal brads to the center of flowers. Add twine bow. Die cut leaves from Sizzix Garden Green Die Set; adhere to tag. Add small butterfly from Tim Holtz Botanical Layers Set to top of the tag. 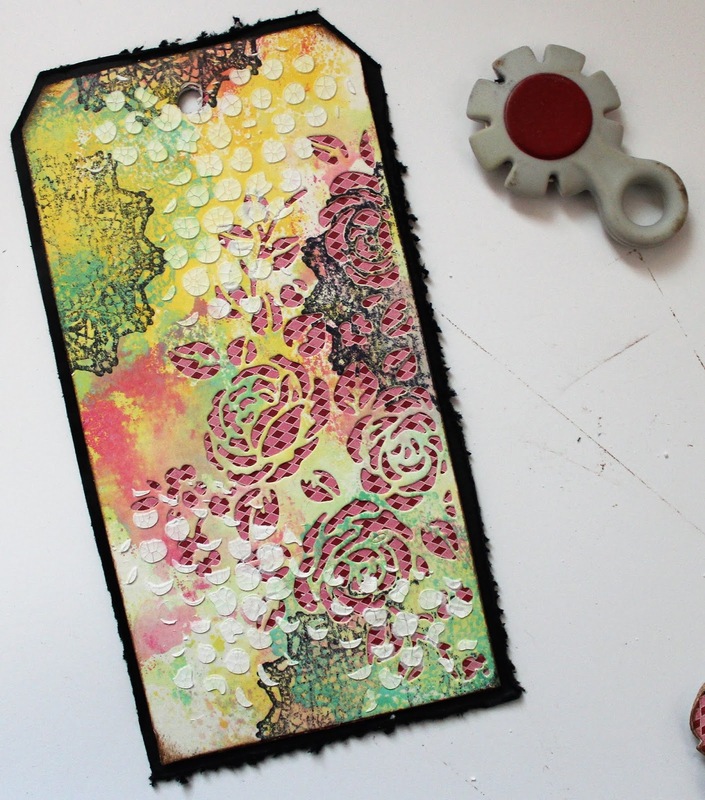 I hope you are inspired to create a mixed media tag, using all your fabulous Tim Holtz products! What a beautiful little piece of art.